The Connect Research Portal is a simple and cost effective platform for providing clients and staff with access to your research library via desktop or mobile browsers. 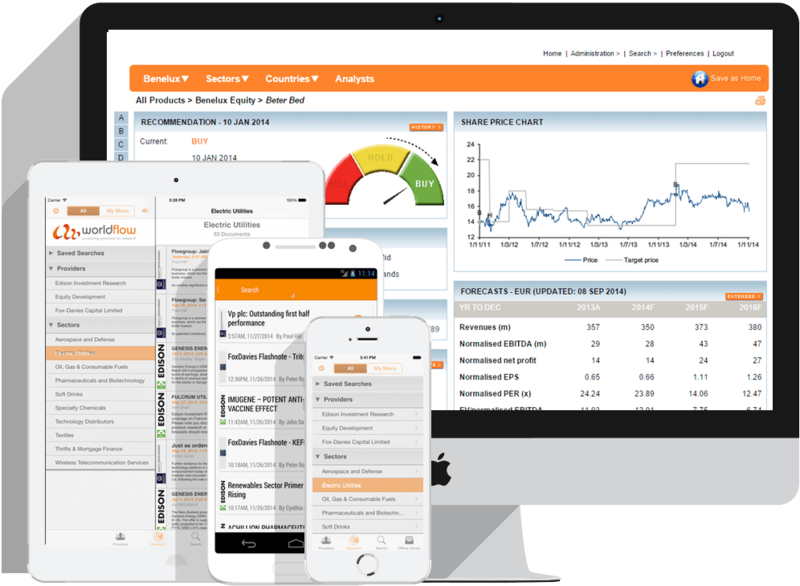 The solution comprises a range of configurable options purpose built to manage the secured distribution of financial research, data and event content. Research Portal provides sophisticated content search, personalisation, auditing and analytics and provides a complete solution for direct distribution of your research. Out-of-the-box solution; branded, built and delivered as a packaged service, new sites typically up and running in around 6-8 weeks. Fully supported by worldflow, requires little or no internal resources to set-up and manage and more cost effective than an internal build would be. Comprehensive navigation and search tools make it easy for clients to find the latest publications, commentary, value add content and archived reports in one place. Supports multiple content types including .PDF, Excel, Audio, Video and Fundamentals/Data so clients can access all your material in the right context. Bundling feature enables you to create tailor-made content packs for individual clients. User defined tagging enables clients to track and report on their own research usage. Can be directly integrated with your CRM making it easier to set up new clients quickly and ensure that only active users have access. Detailed real-time reporting means you can track not only what clients are reading but also what information they’re searching for.